Lug Capping Machine offered provides for optimum functional support and come developed in quality welded steel frame finish so as to provide for lasting performance. Further, these capping machines come in convenient designs for facilitating easy servicing of machine. 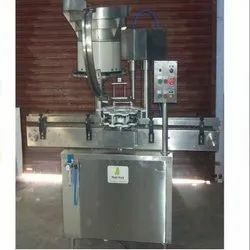 Some of its features include perfect operation support for threading & sealing operations, SS matt finished body, low power consumption, low friction wear surface, allowing for smooth and noiseless conveying, superior resistance against corrosion, adjustable bottle height gauge for easy and quick setting.